National focal points have been identified to improve collaboration and communication on a number of specific enforcement issues between agencies responsible for wildlife law enforcement in different countries. This page provides easy reference to these focal points, containing the latest information as submitted to the CITES Secretariat. It is important to note that national protocol and relevant legislation regulating the exchange of information should be observed at all times. Parties are encouraged to inform the CITES Secretariat of any changes to their nominated focal points. National Ivory Action Plans (NIAPs) are a practical tool used by the Convention to strengthen controls of the trade in ivory and ivory markets, and help combat the illegal trade in ivory. Parties that have been directed by the Standing Committee to develop and implement a NIAP have each identified a national focal point for NIAP matters. The directory of NIAP focal points can be accessed here. A key action arising from the CITES Rhinoceros Enforcement Task Force meeting held in Nairobi, Kenya, in October 2013, was the identification of national focal points for matters related to the illegal trade in rhinoceros horn. All countries implicated in the illegal trade of rhinoceros horn as a range, transit or destination State were encouraged to appoint a national focal point. The focal point is responsible for the facilitation of initial contacts between relevant enforcement agencies within his or her country, and the authorities from any requesting country on matters related to rhinoceros poaching and illegal rhinoceros horn trade. The directory of national rhinoceros focal points can be accessed here. Notification to the Parties No. 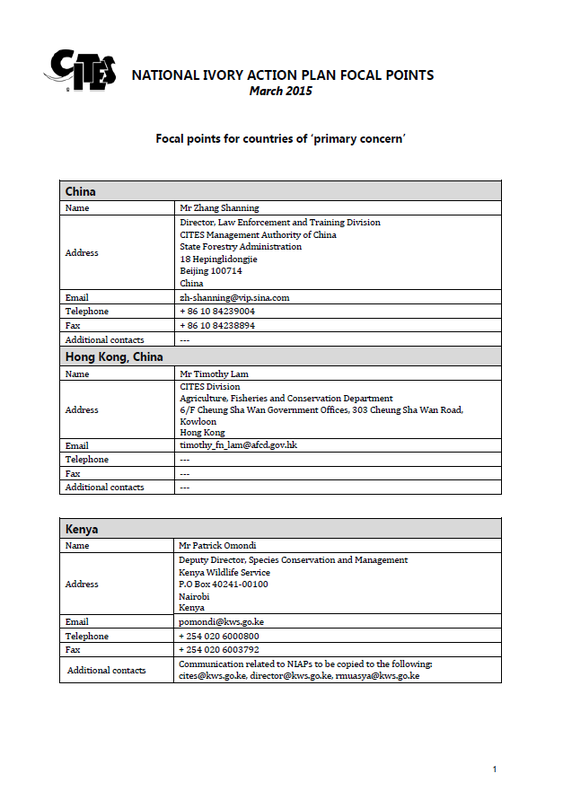 2014/047 of 15 October 2014 concerning the directory of illegal trade in rhinoceros horn focal points can be accessed here. A number of wildlife enforcement networks or groups have been created at the regional or subregional level to increase cooperation and coordination to counter illegal wildlife trade. 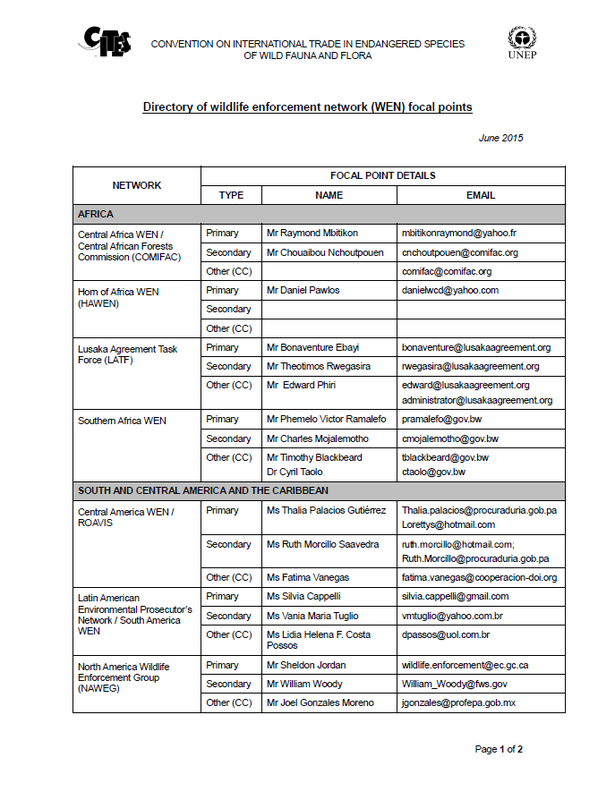 Following a recommendation of the First Global Meeting of the Wildlife Enforcement Networks, a recommendation of the CITES Rhinoceros Enforcement Task Force, and as requested at the Second global meeting of the wildlife enforcement networks, the Secretariat has prepared a directory of wildlife enforcement network focal points to facilitate increased collaboration at the subregional, regional and international levels. The Directory of WEN focal points can be accessed here. Notification to the Parties No. 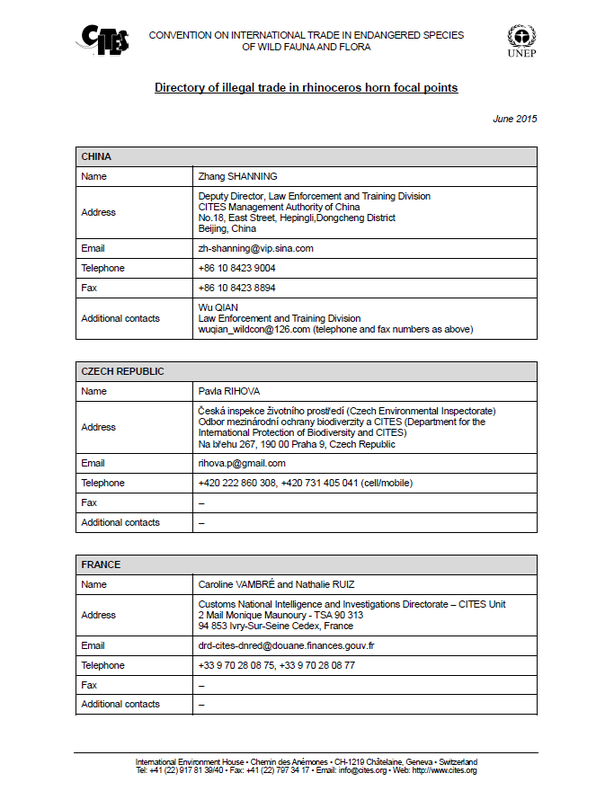 2014/021 of 28 April 2014 concerning the directory of wildlife enforcement network focal points can be accessed here. These details can be accessed through the National contacts and information page on the CITES website, for those Parties that provided it.